Ross County have signed two youngsters on loan from Celtic and Liverpool to boost their First Division campaign. Celtic striker Diarmuid O'Carroll, 19, has signed a deal with the Dingwall side for the rest of the season. The player has represented the Republic of Ireland at all levels up to and including Under-21. County have also signed 21-year-old Liverpool defender James Smith until the summer. Smith has played in the Carling Cup with the Premiership side. The Scottish First Division side have seen two players leave Dingwall, with Gary Irvine opting to return to Celtic to push for first team football. And Amick Ciani left County after his contract expired at the end of December. 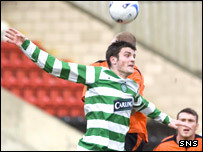 Celtic's head of youth and first-team coach Tommy Burns said he believed O'Carroll would prove successful during his time in Dingwall. "Diarmuid is ready for it. He's had a couple of seasons with the reserves now and is just champing at the bit to get out and show that he is a natural striker who can score goals," said Burns. "This gives him the platform to go and do that." County paid tribute to Irvine after he returned to Celtic Park. "Gary has opted to return to Celtic to push for first-team football," said a County spokesman. "Although we are of course sad to see Gary go, we would like to take this opportunity to thank him for the outstanding contribution he has made to the team during his time here and also to wish him all the best for his future career."